More than a job, it’s an experience. Do you have a real passion for paintball? Perhaps you just love working outside and with people? Do you have a friendly yet assertive personality and superb interpersonal skills? If so, we want you to join our team. 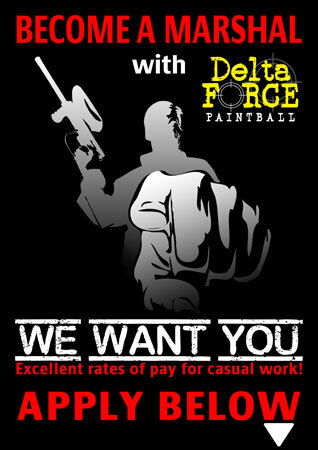 Apply if your interested in working at Delta Force Paintball and you’ll find yourself in a fun-filled, high paced and exciting work environment that you’ll describe more as an experience than a job. Work History: a Kiwi who has worked for Delta Force in New Zealand for more than 12 months. “I’d been out of work for almost 6 months when I applied to work at Delta Force. I had no prior experience and hadn’t played paintball before either but it sounded like it could be fun. I didn’t think it could be very hard to learn. After my first year with Delta Force passed a few weeks back I realized that it wasn’t difficult at all once I got into it. There’s actually a lot more to running a paintball centre than I thought at first which I’m pleasantly surprised about because it has meant plenty of variety in my work. If you are keen and want to learn there’s plenty to do all day long and you learn several skills you never thought of before. At least that how it was for me. I love the motivational side of the work. We all work as a team to help guide and motivate the players so they go away raving about us as marshals, and the experience they had with us as well. That’s a cool feeling. I like the adrenaline rush I get during game play as well. We advertise it to the players on our websites but the excitement exists for the marshals also because we are in the thick of it with the customers. If they don’t have fun, we don’t either. You meet some awesome people doing this too. Not only other staff members but also you get to know some of the players, even if only for a short time on the day. On a another cool note, I was having a 2 week holiday near Melbourne recently so I asked if I could work a weekend at the Delta Force Paintball Melbourne centre. They had a position I could fill during my holiday and I had a blast seeing how they did things across the ditch. I seriously love this job.